Hall 7 Real Estate Development Company said it has concluded arrangements to plant 3000 trees in the 216 development units in Imperial Vista Estate. 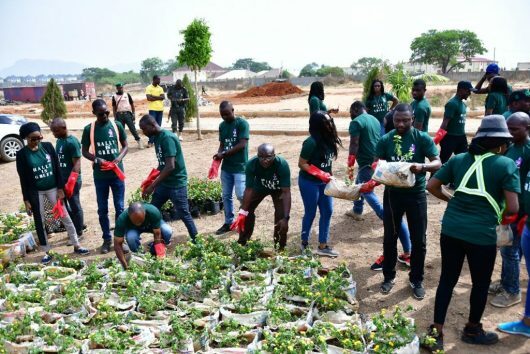 The Chief Exective Officer of Hall 7, Braimo Olayinka stated this yesterday while marking the World Tree Planting Day at the estate in Jabi Life Camp, Abuja. According to him, “tree planting is very important in any environment. Aside the fact that it helps absorb carbon dioxide, it also beautifies the environment. “Any environment that does not have trees planted around it is lacking behind and does not appreciate nature. We are also campaigning against deforestation and encouraging Nigerians to plant trees and promote the green environment which every country is working towards achieving. “In develop societies of Europe and America, people are encouraged to imbibe the culture of tree planting in their houses to promote the green environment. Trees also guard our houses against wind and promotes security”. Also speaking, an Architect with the firm, Maimunat Sanusi said the firm is working assiduously to partner major stakeholders in tree planting exercise across the country. She added that the various agencies of government will also play key roles in ensuring green environment for all Nigerians. On his part, Architect Jiya David while harping on the importance of tree planting in all houses said the venture will stablise the soil. He said Nigerian must take the lead in Africa to bolster its stand as the giant of Africa in all areas.